This is, admittedly, a very noisy graph, even presented year over year. But it’s worth getting through the noise. We’re about to have a new president, one who has promised to bring back our manufacturing jobs. BTW, those words were the most painful for our colleagues in the manufacturing midwest who have lived with the disruption caused by the erosion of manufacturing work in the region; the situation has improved but those on the ground know those jobs are not coming back. 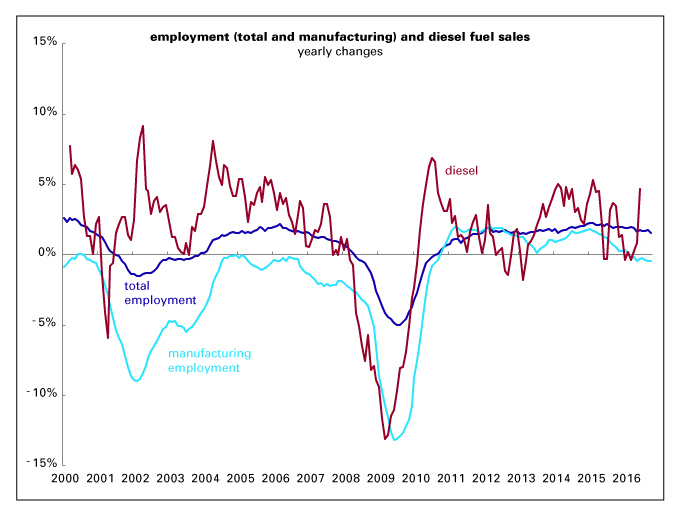 But, as the graph shows, diesel fuel usage tends to lead manufacturing employment, and it really spiked in October. Historically, that would lead to an improvement in manufacturing employment in, you guessed it, early 2017. So if the manufacturing outlook brightens as we move into the new year, remember those tea leaves were thrown in October, not on inauguration day. It’s no secret that many of our more vulnerable workers have it tough these days. In July, the Treasury Department decided to take a look at the widespread use of non-competition agreements among low-wage workers as a factor in ongoing low job churn and wage growth. Additionally, Case Western law professor Ayesha B. Hardaway is looking into the proliferation of these “non-competes” among low-wage low-skill workers as a condition of their at-will employment as a violation of the 13th Amendment. 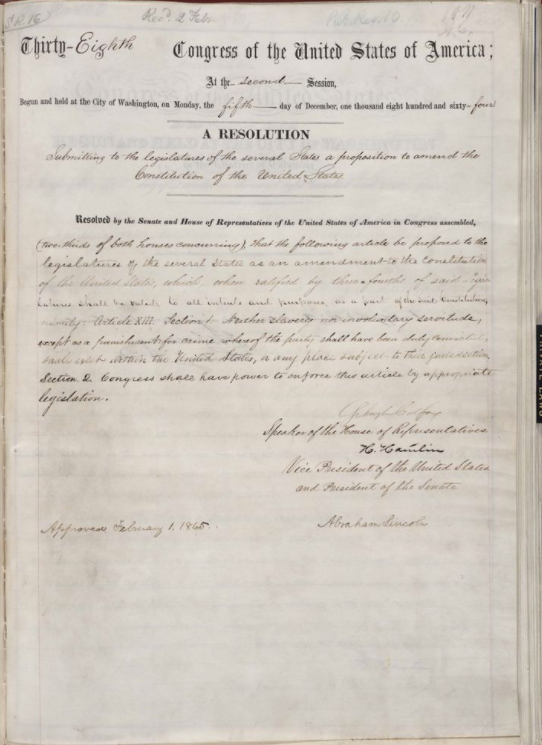 She argues that Reconstruction Era debates, legislation passed after the amendment itself, and judicial opinions of the time make it clear that the prohibitions against indentured servitude and peonage in the broader amendment were intended to prevent wage slavery. Which is what you get if you put at-will employees on this particular one- way street. They are not protected by contracts and, since they cannot seek like similar employment elsewhere, have no bargaining power. And therefore no economic mobility. Hardaway argues that such use is outside the original scope of post-employment restrictive covenants, which were designed to protect trade secrets, thereby encouraging employers to invest in new ideas and in the training of their employees. Restrictive employment covenants have been addressed by the courts for centuries, and US legal thought on such matters came, originally, from British courts in the 16th century. These courts generally put attempts to restrict work opportunities of former apprentices under the rubric “improper and unethical motives of masters.” Specifically, applying the rule of reason, the court stamped the idea that an apprentice could not seek employment in the “very trade he honed during his apprenticeship to be morally improper and outside ordinary norms.” Such thinking on employment restrictions held in England, although specific confidentiality clauses, and non-solicitation and non-poaching agreements, Hardaway’s “original scope,” generally got the green light. And so it was in America until the late nineteenth century, when judicial decisions began to wear away the precedent set by the test of reason. Even so, through the twentieth century such agreements were limited by the courts to high-level employees with access to proprietary information, employees whose names and reputations themselves often added value to the company. These sophisticated workers are on a two-way street: at the same time they sign such agreements, they also sign employment contracts. Hardaway believes that subjecting low-wage un-skilled workers to similar arrangements “fails to comport with the established rule of reason.” Indeed, and worth thinking about with the Politics of Rage getting so much ink these days.